Dear Reader, I need to tell you that the moment I decided to get glasses and contact lenses was after the time that I tried to hail a police car mistaking it for a taxi. However, sometimes, not being able to see things properly isn't the worst thing. It was a hot day when I was shopping at the markets. Mr NQN had dropped me off and I didn't have my contacts in. I just wanted to get in and out as quickly as possible as the crowds brushed past in the crush and everyone was sweaty and irritable. I bought several lots of fruit and in my haste to exit I bought a few bundled up packs. When I got home I realised that I had bought peaches instead of nectarines. 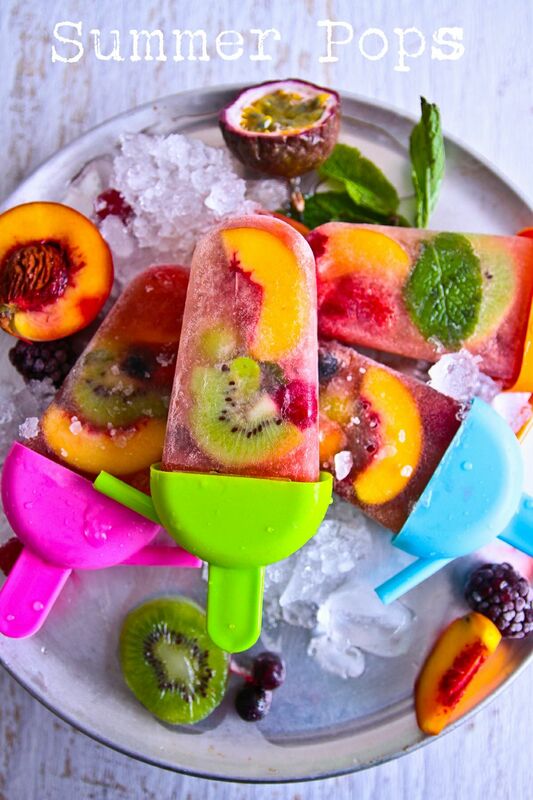 Both good but I know Mr NQN prefers nectarines as he prefers the smooth skin to the fuzzy peach skin so I decided to make some popsicles with the peaches to cool us both down. 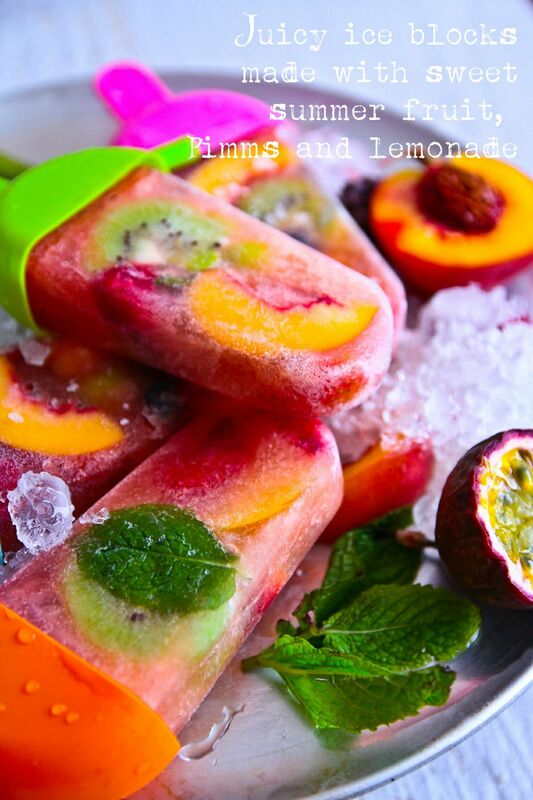 The beauty of these is that you simply stuff whatever fruit you want into them, fill them with a delicious mixture of Pimms and a sweet fizzy drink like lemonade. I actually didn't intend to blog these but they ended up being so gloriously coloured and delicious that I just had to share them with you. 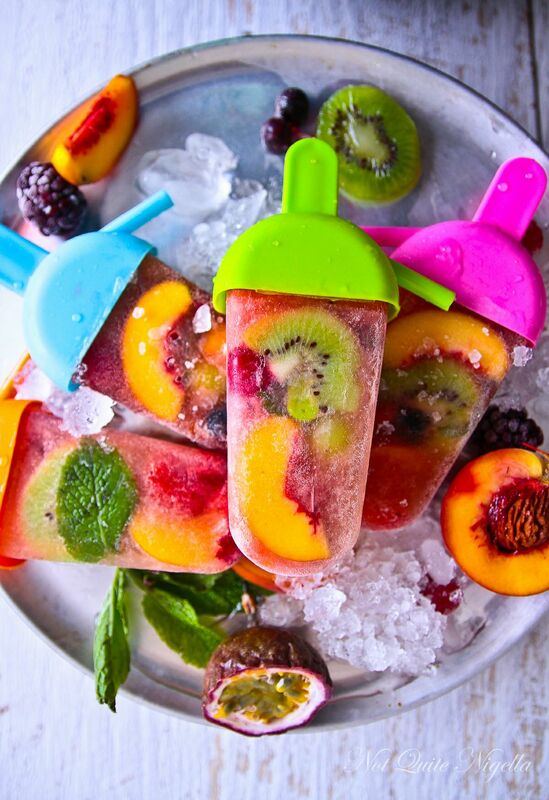 They're also ludicrously simple, just one more step further than a fruit salad and of course feel free to omit the Pimms if you are serving them to children. And if you include the alcohol, well things are that much merrier that way! 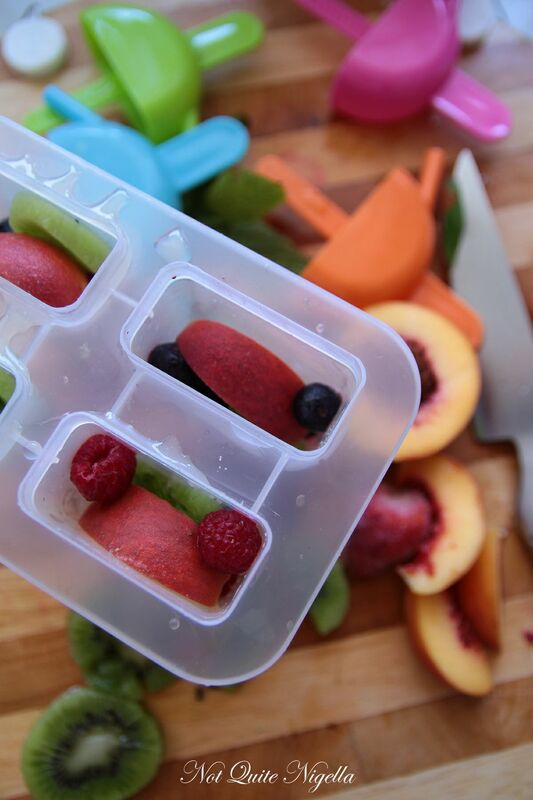 Step 1 - Slice up fruit into smaller portions. 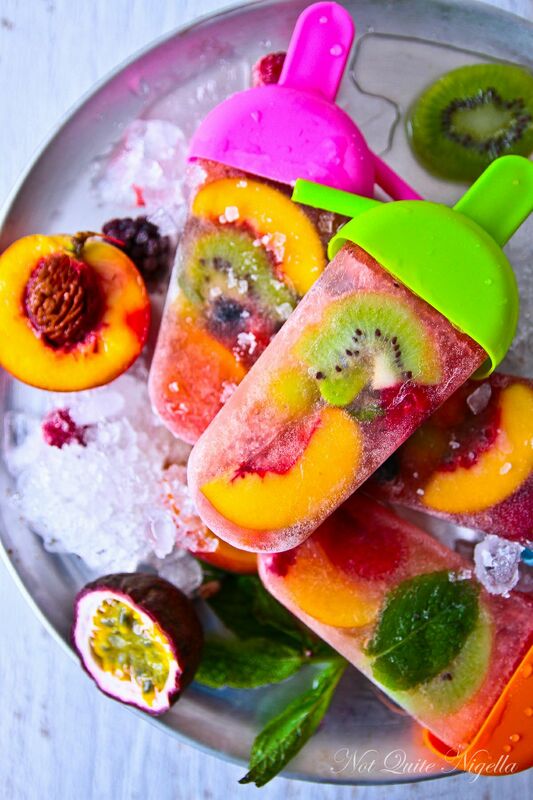 I used small peaches and cut them into eighths and peeled the kiwifruit and cut each slice in half. 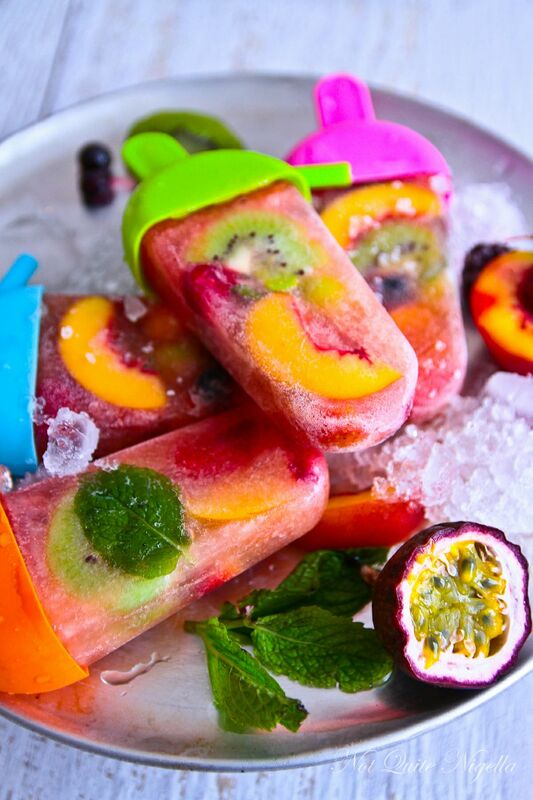 Pop the fruit into the ice block cavities layering them along with a single mint leaf. Step 2 - In a jug, measure the Pimms and lemonade-I recommend letting the fizz subside for a few seconds as it freezes better without so many bubbles, and then pour this into the cavity on top of the fruit. 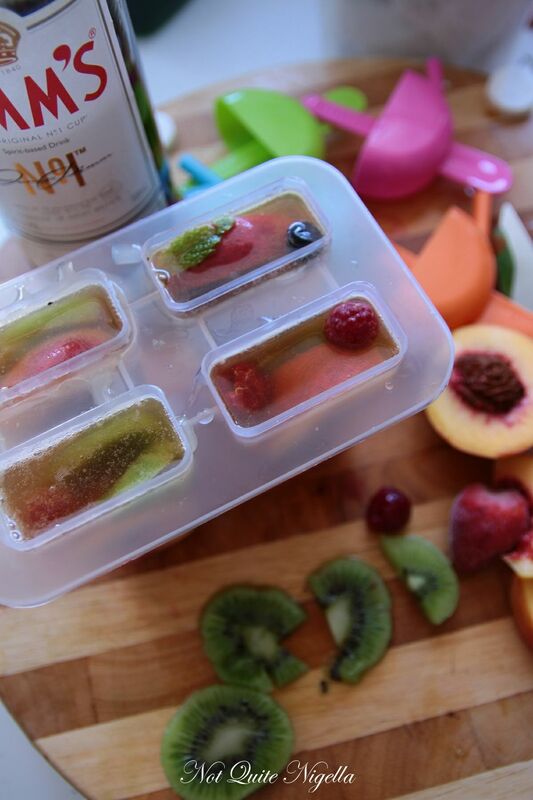 Fill until the line indicated and place tops on the holder and freeze until firm (several hours or overnight). Step 3 - Run hot water along the body of the holders to loosen and pull out gently.